The Terrier Hockey Fan Blog: Blitzed! Terriers were shut out by Maine, 6-0, at Alfond Arena, wasting a final opportunity to gain home ice for the Hockey East quarterfinals. 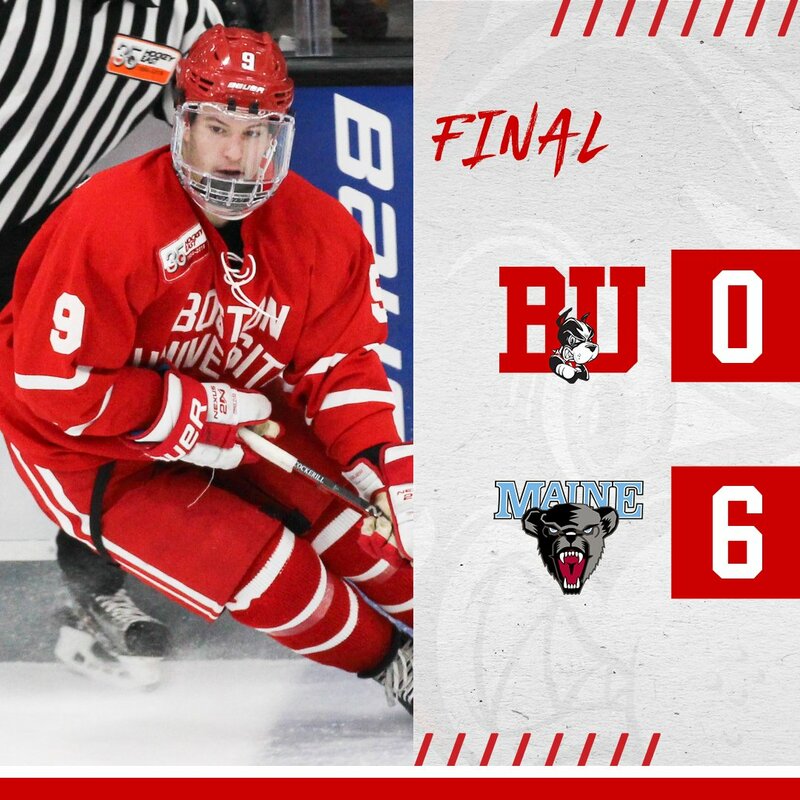 BU was thoroughly outplayed by the Black Bears who scored twice in each period and scored their six goals—all at even strength— on only 26 shots. The game got off to an ominous start for BU as Brendan Robbins scored his first of two goals at 1:44 of the first period, racing into the Terrier zone and beating Jake Oettinger from the right circle. Maine doubled the lead six minutes later. Robbins scored his second goal in the second period, followed by scores by Tim Doherty, Brady Keeper and Mitchell Fossier. Oettinger, who yielded the first of four goals, was replaced midway through the second period by Vinnie Purpura who gave up two goals on 14 shots. BU will travel to Lowell for its quarterfinal best-of-three playoff series, beginning Friday. 2019 recruits Trevor Zegras and Dom Fensore scored goals in the NTDP U18s’ 9-3 win against Lincoln. 2019 recruit Ethan Phillips scored his 13th goal in Sioux Falls’ 4-3 overtime loss to Waterloo. 2020 recruit Drew Commesso stopped 18 shots in a relief effort to pick up the win as the NTDP U17s edged Chicago in overtime, 5-4. Robert Mastrosimone had an assist for the Steel. Brady Tkachuk scored his 16th goal and added an assist in Ottawa’s 3-2 loss to the Bruins. Charlie McAvoy assisted on Boston’s third-period tying goal and Matt Grzelcyk set up the game-winner in the final minute of regulation. #8 Terriers fell to #6 BC, 5-1, in the Hockey East tournament semifinals at Schneider Arena in Providence. 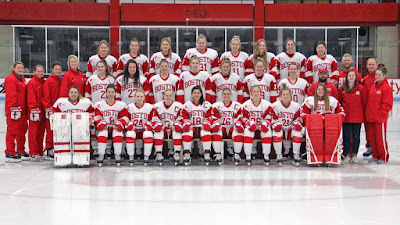 The loss ended BU’s season with a 21-8-8 record, including a 13-3-3 run in the second half of the campaign. After BC took a 1-0 first period lead, the Eagles tacked on two more in the second period before BU’s Abby Cook put the Terriers on the board with a power play goal assisted by Jesse Compher and Kaleigh Donnelly. BC quickly responded to make it 4-1 and added a final goal in the third period. 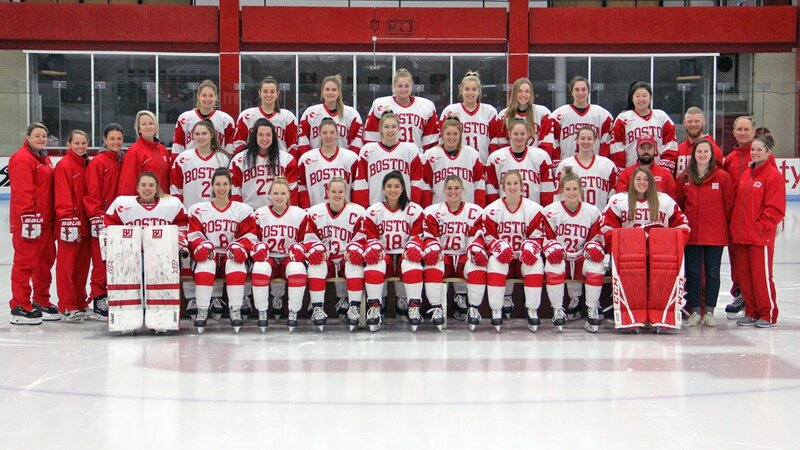 BU graduates three seniors and will return 11 of its top goal-scorers next season, as well as all three goaltenders.